For the first time in more than a decade, voters will decide who will fill a vacant seat on the Wisconsin Supreme Court. Three little-known candidates are running in the February primary; the two top vote-getters will compete in April. To help voters make an informed choice, the Wisconsin Policy Forum sent questions to the candidates about their experience and views. Their responses are presented here in full. Wisconsin voters face an important choice this spring: electing a new Wisconsin Supreme Court justice to fill the first open seat since 2007. The winner will serve a 10-year term, succeeding Justice Michael Gableman, who is not seeking re-election. Three candidates – Madison attorney Tim Burns, Milwaukee County Circuit Court Judge Rebecca Dallet, and Sauk County Circuit Court Judge Michael Screnock – will face each other in the February 20 primary. The top two vote-getters move on to the April 3 general election. 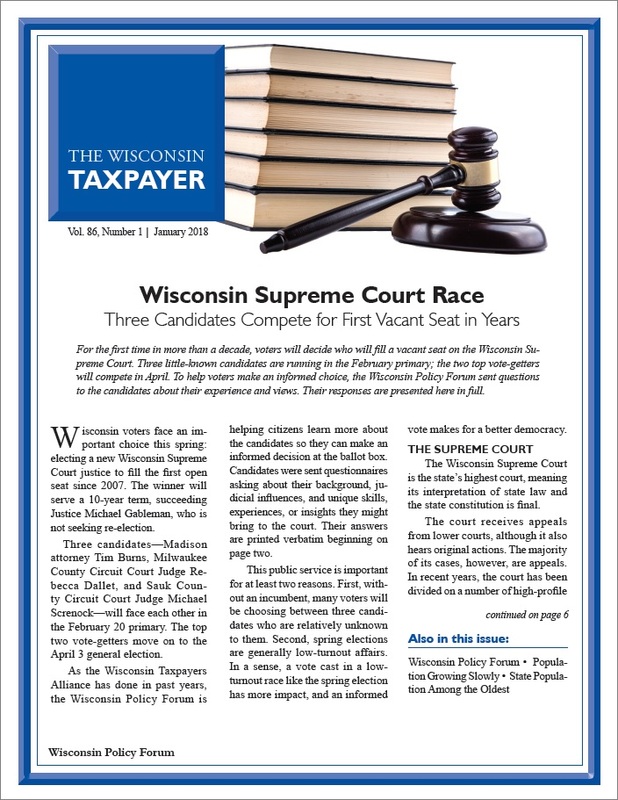 As the Wisconsin Taxpayers Alliance has done in past years, the Wisconsin Policy Forum is helping citizens learn more about the candidates so they can make an informed decision at the ballot box. Candidates were sent questionnaires asking about their background, judicial influences, and unique skills, experiences, or insights they might bring to the court. Their answers are printed verbatim beginning on page two.